I think I can speak for many people when I say that I’m tired of focusing on what I should eliminate from my diet or lifestyle. I prefer to share what people should add to their diet to live healthier. My list of simple suggestions for a healthier diet includes eating more berries, having oatmeal for breakfast, trying kale or new veggies, and of course, I like to encourage people to drink more water. About 40 percent of Americans drink less than half of the recommended amount of water each day, and about 25 percent of kids under 19 drink no water at all, according to government statistics. And Michelle Obama agrees with me! The White House just announced their new campaign, Drink UP! to encourage Americans to drink more water. Water invigorates: If we’re dehydrated, we can feel run down and without energy. This doesn’t help for day-to-day life or exercise performance. 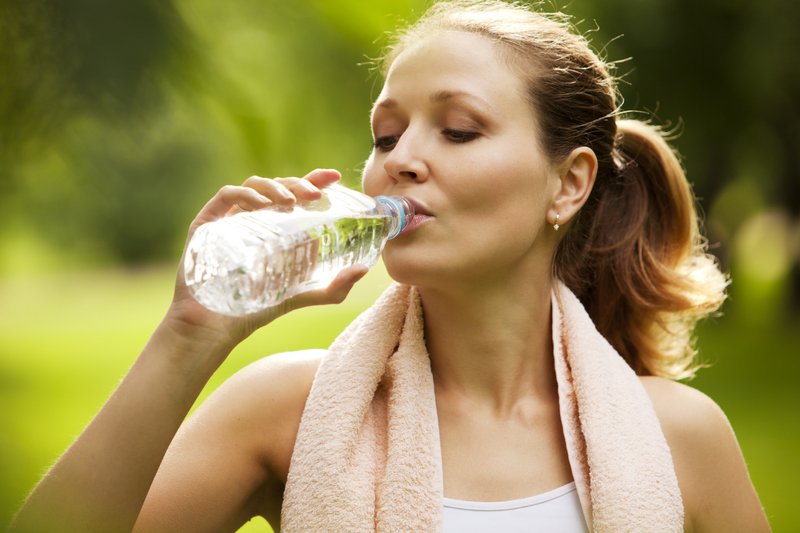 When exercising, dehydration can actually increase your heart rate and perceived exertion. It’s protective: We regulate our temperature and protect ourselves from heat stroke with water. In addition, the amount of blood volume decreases if we are dehydrated and that can adversely impact our blood pressure and heart function. It’s easy! We’re lucky enough to live in a nation where clean water is widely available, easy to carry, and something you can do anywhere. However, despite water’s strong “selling points,” many people report that they don’t like drinking water – my mother for one – and there are those of us that want a little flavor burst every once in a while. For these folks, I suggest they try a calorie-free water enhancer. My go-to is Stur – I love the variety of tasty fruit options and I can adjust the sweetness level myself. As a nutrition advisor for Stur, I know that it’s perfect for consumers looking for a natural option since it’s sweetened with Stevia and its flavor and color comes from vegetable juice. You can still get on board with the Drink Up campaign with a little flavor! How much water do you need? Well, the 8 glasses a day has been around for years, but isn’t supported by scientific evidence. The IOM says that most people can maintain hydration by responding to their thirst. Others speculate that this mechanism doesn’t always work because by the time you’re thirsty, you may already be dehydrated. So, for a second opinion, I recommend taking a look at the color of your urine – shoot for light lemon vs. apple juice. The IOM estimates that it’s about 2.7 L per day for women and 3.7 L for men. That’s from food and fluid – about an 20/80 mix. Dr. Jenna A. Bell is the co-author of Energy to Burn: The Ultimate Food & Nutrition Guide to Fuel your Active Lifestyle (John Wiley & Sons 2009) and Launching Your Dietetics Career (ADA 2011). She is a Senior Vice President, Director of Nutrition at Pollock Communications in NYC and the Chair of the Sports, Cardiovascular and Wellness Dietetic Practice Group. She is also a member of the Editorial Advisory Board for Today’s Dietitian. Jenna is an international presenter at professional conferences, and her writing and expertise have been featured in Self Magazine, Fitness Magazine, Men’s Health, Runner’s World, Outside Magazine, Us Weekly, Pilates Style, IIDEA Health, and various other consumer and scientific publications. She has appeared on the Daily Buzz, ABC, NBC and FOX affiliates, local and national radio programs and podcasts. Jenna is a two-time Ironman Finisher and has slowly completed three marathons! As a new Mom as of April 2013, she’s now committed to training at Physique 57 in New York City.